May 10 – The Eco-Footprint Challenge is nearly over. On May 15, the judges will gather to decide which of 6 schools did the best. And our new video may help us win the top prize! Several of us worked with Mr. Haag and Mrs. Chirico today to give a presentation to the judge for our school project, Curt Kennedy with Huber Technology. 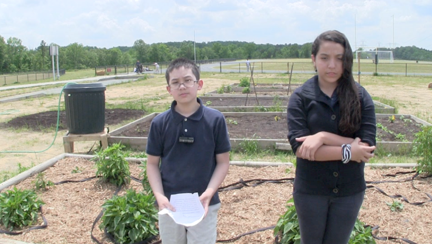 We talked about the problems caused by ozone and how the plants that Clean Air Carolina planted in our school's ozone garden are particularly sensitive to the caustic gas. When levels of ozone get high, like they often do around Charlotte each summer, these plants start changing color and showing other signs of distress. We also talked about our project dealing with water. The gardens need water throughout the summer when we are not here. We put together a rain barrel and will use that to gently water one of the gardens. We also installed a drip hose in the ozone garden. We will measure how the two systems work and which one seems to be better for our gardens. Finally, we showed Mr. Kennedy the green flag flying on the school flagpole. This in ozone alert flag. Green is good, meaning we have a low predicted level of ozone in the air. But when ozone gets worse, the color alert system goes to yellow, orange, red and purple as the air becomes increasingly unhealthy. At orange, people with lung problems such as asthma should not go outside during the day and exert themselves. The purple flag means the ozone level is so high that it is dangerous to everyone.